A scathing article exposing the horrors of a the biggest slave auction in American history. In the past few years, a new discipline in journalism is slowly getting more and more followers — a discipline commonly known as ‘data journalism’. These so-called ‘data journalists’ are usually envisioned as the younger, tech savvy journalists, ones that are not afraid to analyse data, understand how computer code works and simply love these colourful and detailed visualisations. On the other end of the scale are the non-data-journalists . We usually imagine them, still using a phone and Rolodex as they simply don’t get email — and the last technological leap they made was when the mechanical typewriters were replaced by computerised word processors. This basic fact was true a hundred years ago, and is not about to change — even if technology does. For this reason, the best journalists will always be the masters of words; those who have the best understanding of people and what makes them tick. It is the unfortunate truth that the benefit of knowing how to work with data will always come after that. Yet, this majority of journalists is mostly ignored by the data journalism movement — which is a shame, as these are the ones most likely to benefit from it and advance it the most. Flashback to five years ago — I’m one of the few founding-volunteers of an open-data NGO in Israel, “The Public Knowledge Workshop”. One of our first projects was called “The Open Budget” — a website who took the publicly available (but hard-to-understand) national budget data and presented it in a feature-rich, user friendly website. At that time, we tried to meet with as many journalists as we could to tell them about the new budget website — and not many would spare an hour of their busy schedules for some geeks from an unknown NGO. We would show them how easy it was to find information and visualise it in an instant. Then we would ask them whether they might consider using our website by themselves for their work. A common answer that took me by quite a surprise always went along the lines of “That is very nice indeed but I don’t need your website as I have my sources in the Ministry of Finance and they get me any data I need”. The fact that the data was lying there, within a mouse-click’s reach, and they still wouldn’t use it — simply baffled me. It took me some time to understand why it made perfect sense. Was that reporter lazy? Perhaps. But it wasn’t just that. As it turns out, it’s not just a matter of credibility — it’s also a matter of attribution. Journalistic reporting is a delicate art of telling a narrative using only “facts”, not the journalist’s own personal opinions. Journalistic facts (which may be just someone else’s opinion) need to always be attributed to someone, be it a person or an organisation. So you’d get sayings similar to this: ‘according to this NGO, spending on health in the national budget is 20%’. This sort of wording leaves room for other parties to claim the analysis was wrong and the actual number is different. It keeps journalists free from biases — and from accusations of such biases — while still promoting a specific world view. The only catch is that this only works if they are solely reporting these interpretations — not making them. Getting to such a level of expertise is not something that happens in a day. This is another reason why open-data portals are simply not that useful for journalists. Even if the journalist has a clue as to which dataset contains an answer to her question — which is rarely the case, nor that a single dataset will hold the answer — it’s not enough to see the data, you need to make sense out of it. You need to understand the context. You need to know what it really means — and for that, you need an expert. But hard as we tried, our efforts were in vain — none of the methods we tried seemed to be working. We tweeted our findings, wrote about them in our blog, pushed them hard through facebook — we even got a Telegram bot pushing algorithmically detected suspicious procurements in real time! But journalists were not impressed. On other instances, we managed to get a specific journalist interested in a story. The only problem was that sometimes they would hold on that piece of information for weeks without doing anything with it until it became irrelevant — thus losing our chance to use it anywhere else. But he also made us change our ways a little bit — as good leads needed to be kept secret until a good match was found. Exclusivity and patience bought us larger media coverage and a wider reach — but with the price of compromising on our open-data and transparency ideologies. But then we start talking — first we tell them about our different projects and areas of expertise, and the conversation flows to what they’re interested in: what are the ideas they’re trying to promote? which big projects they’ve always dreamt of doing but never had the data? They tell us about all their attempts to get data from the government through FOIA requests that ended in hitting brick walls. That’s usually the point where I take out my laptop. They seem baffled when I start typing a few SQL commands on my terminal, and utterly surprised when after two or three minutes I present them with a graph of what they were looking for. “Wow, I didn’t know it was even possible… and all of that just from data that’s out there?” they say, with a smile and a new sparkle in their eyes. And that’s when I know — a new data-journalist was born. Every once in a while, a beautifully interactive data visualisation project is published by one of the media outlets. Everybody applauds the “innovative use of the medium” and the “fine example of data-journalism” — and I’m also impressed! — but to me this is simply forgetting all these other journalists who made that leap into the world of data. These are the true heroes of the data-journalism revolution. And the motto of this revolution cannot be ‘Visualise More!’ or ‘Use Big Data!’ — it must be: ‘Data is a Source’. Transparency, accountability and open data in the Philippines have just become more palpable to citizens and journalists alike. 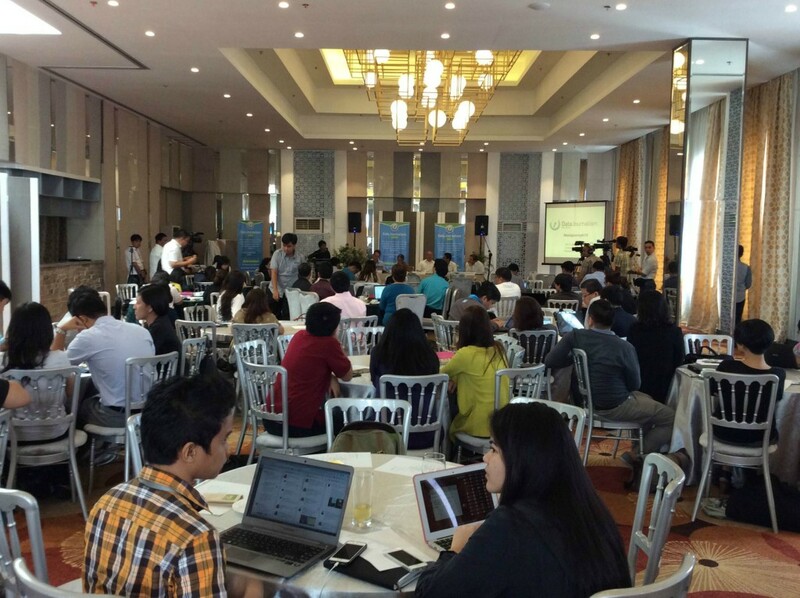 Open Knowledge/School of Data joined forces with the World Bank and the Philippine Center for Investigative Journalism(PCIJ) to launch a five-month training program for 34 journalists from 12 media organizations in the country. The program was kickstarted this morning in a convention in Manila, with strong support of the Philippine government. The event gathered 87 people from all over the country and discussed the challenges and the potential collaboration efforts between civil society and the government to make the Philippines more transparent and accountable through open data. The panel was lead by Malou Mangahas, executive director of the PCIJ, who reflected on the timing and relevance of the program to the Philippines, because of the coming elections. “We’re facing big changes in leadership in the country and we need to think about the way we do conversations around public policies”, she said. “Data could be the narrative that binds us all”. The Philippines has made remarkable efforts in recent years to open its data. In 2010 the government made a commitment to characterize itself by transparency and accountability, leading to its participation in the foundation of the Open Government Partnership in 2011 with seven other countries, including Brazil and the United States. Within the country, the most visible impact of that commitment was seen two years later with the creation of the Open Data Philippines and its Open Data Portal in the 2014. “The goal is to have more than 2000 datasets published by the end of this year”, said Usec Bon Moya, who leads the Open Data Task Force. Moya admits the number is still “a drop in the ocean of Philippine data” and welcomed the contribution of journalists and civil society activists to help the government find the data that is relevant to all stakeholders. “We need your input to make our data more consistent and publish more datasets”, he said. One of the issues acknowledged by the panel is the hard time professionals and citizens have to understand and work with data. A lot of times stakeholders don’t have a clear grasp of how the government works. Commissioner Heidi Mendoza, from the Commission on Audit, said one way to tackle this problem is to engage citizens to work with the government in a participatory process, like the Civil Participatory Audits. “When citizens work together with auditors, they feel stimulated to get to know more the government and its programs”, she said. “The first step to achieve transparency is to show everybody we have nothing to hide” Keneth Abante, Department of Finance, Philippines It goes a long way if the government itself is willing to open its data, regardless of public pressure. Kenneth Abante, from the Department of Finance knows that and showed the audience ways journalists can help the office identify frauds and get smuggles just by analysing the data they publish. “The first step to achieve transparency is to show everybody we have nothing to hide”, he said. “We release every week and month important data that can be mined by journalists and activists.” To have a taste of how to take Mr. Abante’s invitation seriously and actually find stories in data that is already published in the Philippines, Kai Kaiser, senior economist from the World Bank, walked through a mini-data investigation. Using open data about tobacco, Kaiser raised questions about components that are imported to the Philippines and the relationship between the values declared by importing companies and the actual prices in the market. “That’s how you can find holes and corruption in the system”, he said. Kaiser’s example was picked up by Rogier van den Brink, also from the World Bank, to show how the concept of Open Government can lead to better democracies and better relationships between governments and its citizens. Nevertheless, Mr. Brink reminded the audience that transparency is not enough. “The idea of open data is potentially transformative, but more needs to be done”, he said. “We need to collect and give feedback at all times and we also need to follow up on our initiatives.” After the conference, the 34 journalists will participate in a 3-day hands on training about data analysis, cleaning, scraping and visualisation. The workshop will be lead by our own Sam Leon, School of Data trainer and data analyst. The training is just the beginning of a 5 month process in which the journalists will have conference calls with Open Knowledge/School of Data to help on their data investigations. Ideally each group of journalists will have produced a data driven investigation by the end of the program using the skills and tools presented during the workshops and mentoring sessions. “We are very excited and looking forward to see which stories are hidden in the Philippine open data landscape”, said Sam. Luego del cambio del Jefe de Gabinete de Nación, el paso de los meses, se reanudaron los encuentros del Grupo de Trabajo Abierto. – Presentación de los nuevos integrantes de la Coordinación de Gobierno Abierto. – Situación y dinámica de trabajo sobre el II Plan de acción ante la Alianza para el Gobierno Abierto (AGA). – Situación del informe de auditoría externa del 1er plan de acción. – Participación de Argentina en la Red de Gobierno Abierto en Asunción – Paraguay. Desde Open Knowledge Argentina estaremos participando en la reuniones. Por Silvana Fumega – Análisis de los aspectos de los movimientos de datos abiertos vs. el de acceso a la información pública. Los invito a leer el informe de Silvana que detalla las diferencias y puntos de relación entre las comunidad de datos abiertos y las de acceso a la información.